Many strategic planning executives assume that their strong leadership will lead their company to grow and thrive. Some of us are more visionary and curious by nature. Others are more comfortable taking great ideas and immature products and improving them using their analytical, financial and marketing skills. The simple idea behind design thinking is that you need both traits in leadership: the exploratory innovative to produce great ideas, and the analytical that exploits the business, improves the offering, and develops the right processes to gain market share. In the spirit of cooperative intelligence here are some nuggets that Arik Johnson, Chairman of Aurora WDC recently shared with the Denver Association of Strategic Planning (ASP) chapter. Check out his presentation! The ideas behind design thinking are well expressed in Roger Martin’s The Design of Business. 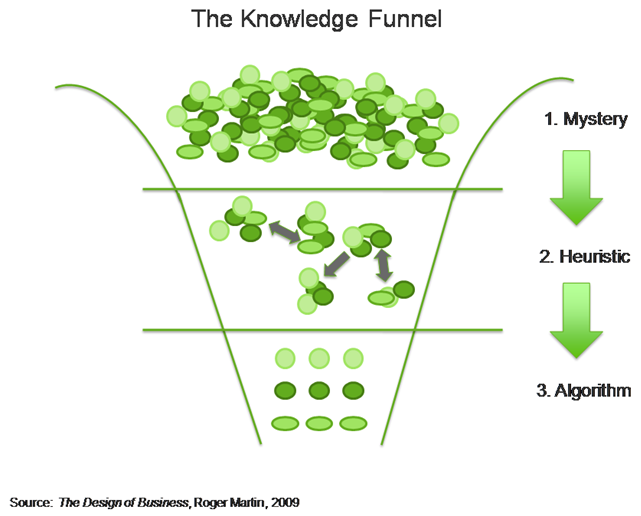 Think of both the learning and the discovery process as moving through a knowledge funnel. People need to apply analysis and creative thinking at different points within that funnel. New firms emphasize exploration. As they mature, they shift to exploiting known ideas, but if they stop at that point, other innovators will surpass them. Your organization must balance predictable or reliable production with validity, experimentation that leads to new ideas and commercial success. To protect a company, leaders must protect the exploration that leads to its validity. However, over time, organizations tend to emphasize reliability instead. We are too analytical which is good for refining current knowledge, but not great for innovating, the mystery stage. Sometimes we push product development too quickly once the product is in the marketplace, and customers aren’t ready to leap that far just yet. Or we make the product too feature rich and hard to use. This gives entrepreneurs a chance to enter the marketplace or competitors to gain share whose product is developed in balance with customers’ needs and acceptance. Roger Martin gives examples of companies whose leadership supports design thinking. McDonald’s has perfected the hamburger business to be operationally efficient and serves the same hamburger product worldwide. The company creates new food products, and perfects production of products that the public supports. For example, McDonald’s managers noticed customers were coming in with Starbuck’s coffee when buying their food at McDonald’s. So McDonald’s analyzed the market and developed an upgraded gourmet coffee to capture that business, which has been very successful. Proctor & Gamble provides another example of applying successful design thinking. P&G was losing market share across many of its numerous product lines. The company was investing considerable money into internal R&D and their products were losing market share due to lack of innovation. So they set up an external R&D lab (basically outsourcing their R&D), which has encouraged a higher level of innovation. As a result, their market share has climbed back up again. A third example cited is Research in Motion (RIM) founded in 1984, but didn’t make it big until 1995. CEO Jim Balsillie was an intuitive thinker. Like many leaders with this tendency, he was distracted with new mysteries and got to the heuristic stage and then launched into the next project. It wasn’t until he hired co-CEO Mike Lazaridis to oversee sales and manufacturing (reliability) that the company took off. Now the company has the benefit of design thinking between the two CEOs. Similarly Arik Johnson explained how he was influenced by design thinking when he promoted his brother Derek to CEO, due to his strong analytical and operational skills. Arik realized his visionary and exploratory skills were critical to create his business, but his brother’s skills would be more valuable in growing the existing business. Company founders are often entrepreneurial and visionary. Arik is now the company’s Chairman and has started an R&D lab, where he can focus on solving complex competitive intelligence problems and develop intellectual property around that line of business. Morton suggests that to develop your design mind, broaden your “personal knowledge system.” To start, be honest and identify the gap between what you think you know and what you actually know. Living in the world of guessing is detrimental to business. That’s why you need to understand both your known strengths and weaknesses as an individual and gain the knowledge you don’t yet have. Design thinking and operating can give your company and you a competitive advantage since they provide a good balance between innovation and operational excellence. As a competitive intelligence professional I see another value to design thinking: it helps expose company and individual blind spots just as a course of doing business. What a competitive advantage is that!